High blood pressure is a condition with serious health consequences that affects up to 80 million American adults. When detected and treated early, however, it can reduce the risk of heart attack, stroke, and kidney disease. Blood pressure is the outward force that blood exerts on artery walls. Arteries are the blood vessels that carry blood and oxygen from the lungs to all of the organs and tissues of the body. Arteries are composed of muscle and flexible, the elastic connective tissue that stretches to accommodate the force of blood flow generated by the heart. And the pumping action of the heart is what allows blood to travel through these arteries. Blood pressure is expressed in two numbers. The top number, systolic blood pressure, reflects the force generated by the contractions of the heart. The bottom number, the diastolic blood pressure, refers to the pressure of blood against the walls of the arteries when the heart is resting between contractions. After the age of 20, all adults should begin to monitor their blood pressure at their regular healthcare visits. If you are older than 40 or have risk factors for high blood pressure, you should have your blood pressure checked in both arms at least annually. It’s important to use the correct size blood pressure cuff, which is why it may not be adequate to check your blood pressure in an automatic machine at the pharmacy or grocery store. Normal blood pressure is considered to be less than 120/80 mm Hg. With 24-hour monitoring or frequent home blood pressure monitoring, daytime normal blood pressure is defined as an average blood pressure less than 135/85 mm Hg. If your numbers are higher than this, it does not mean you have high blood pressure. Blood pressure can change in response to exercise, stress, medication, illness, and even the time of day. It’s important to take several readings over time in order to make an appropriate diagnosis. Most adults with high blood pressure have primary hypertension, previously called “essential” hypertension. This simply means that the elevation in blood pressure is not due to any other cause. Primary hypertension gradually develops over several years. Unless you monitor it, you may never even be aware that you are experiencing a problem that could lead to significant organ damage. Secondary hypertension refers to hypertension that is caused by another condition or medication. In most cases, secondary hypertension occurs suddenly and may cause a greater elevation in blood pressure than primary hypertension. Thyroid disorders, kidney disease, obstructive sleep apnea, alcohol abuse, illegal drugs, and tumors of the adrenal gland are some of the causes of secondary hypertension. After the age of 45, men are more likely to develop high blood pressure. In women, the risk increases after the age of 65. African Americans are at greater risk of hypertension which tends to develop earlier and cause more serious complications. Stress can also increase blood pressure temporarily and, over time, lead to chronic hypertension. Although children are at lower risk of developing essential hypertension, they can develop high blood pressure as a result of other conditions. A child's blood pressure should be measured at each annual check-up and compared to other children of the same age group. Prehypertension. If your systolic blood pressure is between 120-139 mm Hg or if your diastolic blood pressure reading is between 80 and 89 mm Hg, you may have prehypertension. Prehypertension, like high blood pressure, carries an increased risk of cardiovascular disease and typically worsens over time. Treatment includes nonpharmacological measures, such as weight reduction, increased physical activity, avoiding excess alcohol, and restricting salt intake. Stage I hypertension. This refers to a systolic blood pressure of 140 mm Hg to 159 mm Hg or diastolic blood pressure of 90 to 99 mm Hg. If only one of these values is elevated, then the higher value determines the severity of hypertension. This will lead to the determination of the appropriate treatment. Isolated systolic/diastolic hypertension. Patients with systolic blood pressure greater than 140 mm Hg and a diastolic pressure of less than 90 mm Hg are considered to have isolated systolic hypertension. Those with a diastolic pressure greater than or equal to 90 mm Hg but with a systolic pressure less than 140 mm Hg are considered to have isolated diastolic hypertension. The systolic blood pressure is the best predictor of risk in individuals over the age of 60. Studies show that there are significant benefits to treating blood pressure, particularly in patients with mild hypertension. Current recommendations suggest that blood pressure medication is initiated in patients with stage I hypertension, although it should be started earlier in people who have heart disease, diabetes, or chronic kidney disease. Stage II hypertension. This refers to more hypertension, with a systolic pressure of 160 mm Hg or greater or a diastolic pressure of 100 mm Hg or greater. Stage II hypertension may initially require more than one medication for treatment. Malignant hypertension. This refers to extremely high blood pressures, over 180 mm Hg systolic or 120 mm Hg diastolic, that develop quickly and produces end-organ damage. Malignant hypertension is a condition that requires immediate medical care. This condition is also known as hypertensive urgency or hypertensive emergency. Symptoms may occur as a result of organ damage, including confusion or mental status changes, blurred vision, seizures, shortness of breath, swelling, and chest pain due to angina, heart attack, or aneurysm. The United States Preventive Services Task Force recommends ambulatory blood pressure measurement for accurate diagnosis of hypertension. Although you may have elevated blood pressure when measured in your doctor's office, this can be the result of "white coat hypertension." Screening by your healthcare provider may also miss "masked hypertension." 12- and 24-hour average blood pressures using ambulatory blood pressure monitoring are often significantly different from readings taken in a clinic or hospital setting and result in fewer patients requiring treatment, with significantly fewer patients requiring treatment as a result. Other patients may have elevated blood pressure averages discovered with ambulatory monitoring that place them at risk for stroke and cardiovascular disease even when the readings obtained in a healthcare setting are normal. If you are diagnosed with hypertension, your physician or health care provider may order laboratory tests to determine whether or not there is a secondary cause, such as a thyroid abnormality or abnormality of the adrenal gland. Other blood tests will measure electrolyte levels, creatinine, and blood urea nitrogen to determine if your kidneys are involved. Urinalysis is another test often used to diagnose kidney damage as a result of blood pressure and to rule out kidney disorders that can be a secondary cause. Lipid profiles measure your cholesterol levels and are used to assess your risk of cardiovascular diseases like heart attack and stroke. Imaging studies are used to identify possible tumors of the adrenal glands or damage to the kidneys. If you are diagnosed with hypertension, you will also need an eye examination. An examination with an ophthalmoscope can determine the effect your blood pressure has had on the blood vessels in the eye and whether or not your retina has sustained damage. In addition to an electrocardiogram (ECG) to evaluate possible heart damage, an echocardiogram may be used to see if your heart has become enlarged or if you have other cardiac problems related to hypertension, like blood clots or heart valve damage. Doppler ultrasound examination can be used to check the blood flow through the arteries to determine if they have narrowed, thus contributing to high blood pressure. The initial treatment for hypertension includes changes in lifestyle and diet to eliminate or reduce contributory factors like obesity or a high sodium diet. Smoking cessation and reduction of alcohol use—one drink a day for women and two drinks a day for men—are important steps for reduction of blood pressure. Your doctor will probably recommend regular aerobic exercise which has a beneficial effect on blood pressure. Evidence shows that brisk walking for at least 30 minutes daily several times a week is beneficial for blood pressure reduction. There are also a number of different medication classes available for the treatment of hypertension. The JNC 8 recommendations for treatment of blood pressure are based on evidence from multiple studies in many different populations. People with stage II hypertension may need initial treatment with two medications or a combination drug. Follow-up is important. If your blood pressure goal has not been achieved after a month of treatment, your healthcare provider may increase your dose or add a different class of medication. After you reach your blood pressure goal, you must continue to monitor your response to treatment and development of any other conditions in order to prevent the progression of problems. The damage is cumulative over time. 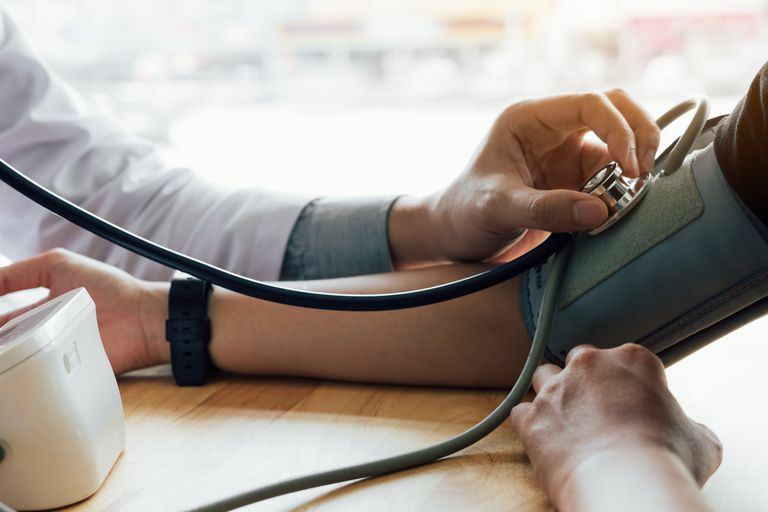 High blood pressure is rarely associated with symptoms, so it is often left untreated or overlooked until permanent and devastating organ damage has occurred. When blood pressure is increased, the walls of the arteries may become injured or stretched. Damage to the blood vessels can create weak regions that give rise to aneurysms or rupture. Damage to the heart muscle can also cause atrial fibrillation over time. Atrial fibrillation is an irregular heart rate that puts you at risk for stroke. High blood pressure can also tear the inner layer of the arteries, allowing the buildup of scar tissue that attracts cholesterol debris and platelets (blood cells that form clots). Cholesterol build-up in damaged blood vessels is called a plaque. These plaques cause a narrowing of the arteries, which results in more work for the heart to pump adequate blood through the body. Plaque can rupture under high pressure. This causes platelets to adhere and form a clot that can break off and travel throughout blood circulation, blocking oxygenated blood from reaching critical tissues. Additionally, these clots may break off and travel to other parts of the body, blocking blood flow and causing heart attacks or stroke. Clot formation also narrows the artery, making the heart work harder to pump blood with oxygen throughout the body. Damage to the arteries from high blood pressure, including scarring and cholesterol build-up, results in a stiffening of the arteries. This causes the heart to work harder to push blood throughout the body. The heart is a muscle, and over time, it will become damaged and floppy as a result of high blood pressure. The chambers of the heart will enlarge and the muscular fibers will not be able to contract adequately to compensate, resulting in heart failure. Hypertension is a serious chronic disorder that can cause many harmful health effects over time. If you are an adult over the age of 20, you should have your blood pressure checked by your healthcare provider at your regular health visit. If you are over the age of 40, it's important to have your blood pressure checked annually. Remember, the reading you get from a manual machine or at the pharmacy may not be accurate. Detecting high blood pressure early can prompt you to make healthy changes in your diet and lifestyle that will reduce your risk of serious disorders like stroke or heart attack. If you fall in a high-risk category, have your blood pressure checked today. Eckel RH, Jakicic JM, Ard JD, et al. 2013 AHA/ACC guideline on lifestyle management to reduce cardiovascular risk: a report of the American College of Cardiology/American Heart Association Task Force on Practice Guidelines. J Am Coll Cardiol. 2014; 63:2960. Hsu CY, McCulloch CE, Darbinian J, et al. Elevated blood pressure and risk of end-stage renal disease in subjects without baseline kidney disease. Arch Intern Med. 2005; 165:923. Levy D, Larson MG, Vasan RS, et al. The progression from hypertension to congestive heart failure. JAMA. 1996; 275:1557. Siu AL. U.S. Preventive Services Task Force. Screening for high blood pressure in adults: U.S. Preventive Services Task Force recommendation statement. Ann Intern Med. 2015; 163:778. Taylor BC, Wilt TJ, Welch HG. Impact of diastolic and systolic blood pressure on mortality: implications for the definition of "normal". J Gen Intern Med 2011; 26:685Vakili BA, Okin PM, Devereux RB. Prognostic implications of left ventricular hypertrophy. Am Heart J. 2001; 141:334.